The birds at our feeder were not happy with me this morning because I forgot to fill it last night! So, I dusted the inch of snow off and overloaded it up. 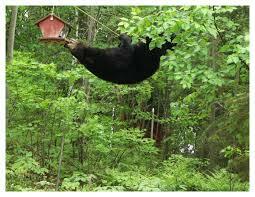 Ours hangs high from the ground off our dining room window, so the bears can’t get at it. I wonder if they have gone back to sleep until spring comes again….. The Tyson Ladies Aid meeting will take place this Thursday, but will be held at the Fire Station instead of the Community Room at Tyson Church. It has been decided to try different venues. We had an interesting book discussion last week and it always causes me to ponder when I hear other perspectives. We will be reading a mystery for our next selection and I will share the exact title as soon as I learn it. Our next meeting with be 5/12. We have lots of fun, so consider joining us! By the way, did you know that there are all sorts of enjoyable activities that are open to our youngsters at Fletcher Memorial Library! I take our pre-school grandson, Landon, to the Toddler and Preschool Story Time on Wednesdays from 10:30-11:30 AM, where we sing, listen to stories and do a simple craft. Sometimes we meet Jeremiah Bellows there, too! Registration is needed for Crafty Tuesdays which is for grades K-6 from 3:00-4:00 PM. School age students are invited to come to the library, choose a book, and read with Oreo from 3:00-4:00 PM the third Thursday of every month. Her next visit will be: April 21, 2016. New is Bedtime Math’s Crazy 8s Club for 3rd – 5th graders on Thursdays from 3:00 – 4:00 PM, except the 3rd Thursday. To learn more you can reach Children’s Librarian Sasha Krawczyk at 228-3517 or skrawczykvt@gmail.com. This entry was posted in Community News and tagged Fletcher Memorial Library, Plymouth Reading Group, Tyson Ladies Aid. Bookmark the permalink. Not to worry, we put back out our feeder the other day, because we thought the birds needed some seed with the round covered. A bear came by and cleaned t out the first evening. The tracks were all over our yard and driveway.